The Houthi rebels and the Yemeni regime have been fighting for a decade. Ahram Online reviews the important milestones in the conflict. Supporters of former Yemeni parliamentarian and Zaidi Shia religious leader Hussein Badr El-Din El-Houthi and the Yemeni regime, led by former president Ali Abdullah Saleh, who is also a Zaidi Shia, first clashed in the north-western Yemeni governorate of Saada in June 2004. El-Houthi, who hailed from the governorate on the Saudi border, claimed that he was protecting the Shia community in Saada from government attacks, while Saleh's government claimed that the former MP was trying to overthrow the Republic to reinstate the Zaidi Imamate that existed for centuries in North Yemen prior to the 1962 revolution. The clashes ended in September 2004, when Hussein El-Houthi was allegedly killed by the Yemeni armed forces, after which his brother Abdel Malik El-Houthi took over leadership of the growing movement, whose fighters call themselves Ansar Allah, or "Supporters of God". Hundreds of Yemenis were killed. The following year, fighting resumed between the Yemeni armed forces and the Houthis, who sought revenge for the killing of Sheikh Hussein Badr El-Din El-Houthi. Saleh offered the Houthis a presidential pardon in exchange for an end to their rebellion, but the militant group declined the offer. Clashes continued until May 2005. Th pro-regime tribe of Hamdan battled with pro-Houthi tribes in the south-west governorate of Dhamar, south of Sanaa. In March 2006, fighting ceased, after the government released 600 Houthi fighters. The Yemeni regime wanted to end the fight in order to hold presidential elections later that year. In September 2006, Saleh won another presidential term. Once again, clashes erupted between Houthi fighters and Yemeni armed forces. Some 1,400 fighters from both sides and about 100 civilians were killed. A ceasefire agreement was reached in June 2007, after Qatari mediation between the Houthis and the Yemeni government. According to the agreement, Abdel Malik El-Houthi, the current leader of the Ansar Allah movement was to seek exile in Qatar, while captured Houthi fighters would be released in return. Fighting erupted between the Yemeni armed forces and the Houthi fighters in Saada near the Saudi border. In total, over 1,000 people were killed in the clashes and not less than 70,000 people were displaced from their homes. On 17 July 2008, Saleh announced that the fight was over. Yemeni armed forces launched a major offensive operation, called Operation Scorched Earth, against the Houthis in North Yemen on 11 August 2009. No less than 10,000 Yemenis were displaced by the fighting. Clashes expanded and, for the first time, fighting erupted between the Houthi fighters and Saudi armed forces across the Saudi-Yemeni border. Houthi fighters accused Saudi Arabia of supporting the Yemeni government and attacking them, while the kingdom denied those allegations and stated that it was defending its territories. Saudi armed forces regained control of a territory on the Yemeni-Saudi border seized earlier by Houthi fighters. Yemeni government and Houthi fighters signed a ceasefire agreement, and hundreds of prisoners of war from both sides were released. Houthis captured the Monaba district in the Saada governorate. Clashes once again erupted between Houthis and pro-government tribes in the region of Harf Soufian, in the Amran governorate, directly to the south of the Saada governorate. The fight developed into a clash with the armed forces, in which Houthis captured 200 soldiers. By 29 July 2010, up to 70 people had been killed. 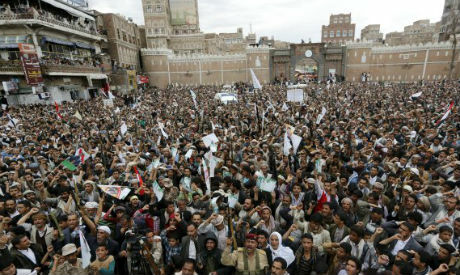 The Yemeni revolution kicked off on 27 January, with protesters demanding that Saleh step down from his position as president. Abdel Malik El-Houthi declared his full support to the demands of the protesters and his followers joined the protesters in north Yemen. Houthis seized control of the whole of the Saada governorate, and declared the creation of their own administration for the Saada governorate. Fights erupted alternatively between Shia Houthi fighters and Salafist groups, pro-government tribes and Sunni Muslim-Brotherhood-affiliated Islah party militia in the northern governorates of Saada, Hajja, Al-Jawf and Amran. On 23 November 2011, Saleh signed a power transfer agreement in Riyadh, and stepped down after 33 years as president. His vice-president Abd-Rabbu Mansour Hadi became the president. The Houthis did not welcome the agreement, because it guaranteed the former president immunity from prosecution. Up to 200 were killed in the fights between Salafists and Houthis in Saada alone. Fights erupt between Houthi militants and Islah loyalists and Salafists in the northern governorates. Houthis claimed that they confiscated Saudi weapons and ammunition from Salafist fighters in Saada. Houthis protested against increased fuel prices in the Yemeni capital Sana'a. On 21 September, they took control of the capital, forcing then prime minister Mohamed Basindwa to resign. The Houthis later signed a unity government deal with other parties. Up to 300 people were killed. The clashes continued until the Houthi fighters stormed the presidential palace and private residence of President Hadi in Sanaa. On 22 January, president Hadi and his administration declared that they had resigned. The Houthis dissolved the parliament and declared a revolutionary committee led by Mohamed Ali El-Houthi as the official ruling power in Yemen. Arab embassies closed in the Yemeni capital and diplomatic missions left. President Mansour Hadi fled Sanaa to his hometown of Aden, where he declared that he reclaimed power and that the Houthis and former president Saleh had staged a coup against him. Several diplomatic missions, mostly from Arab countries, returned to Aden. On 25 March, Houthis stormed the city of Aden and Hadi's residence, capturing his minister of defense Mahmoud El-Subaihi. On 26 March, Saudi Arabia declared that it had launched a military operation, called Operation Firmness Storm, with up to ten other countries, including GCC countries, Egypt and Pakistan, in order to restore "legitimate rule" in Yemen. It is all about power grab and tribal disputes. Let them have it as long as they respect the rights of other groups. Arabs are so backward and still living in the Dark Age.